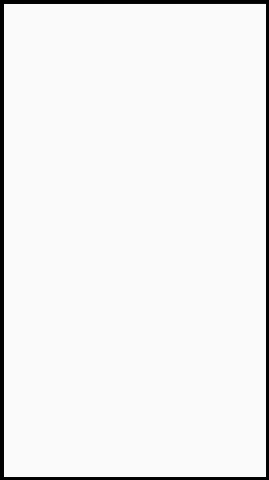 On September 11, Aubrey Sitterson tweeted out the following. It had a bit of an impact. There was not, at the time, much response. 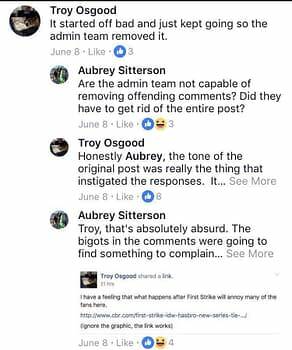 A day later, Terry Dizard a prominent and successful GI Joe fansite YoJoe.com, posted that they would be cutting coverage of all IDW products until Aubrey was removed from all Hasbro licensed books. “On several occasions between February and June of this year, Aubrey joined and would attempt to market his book to a private Facebook group for G.I.Joe. Many long time fans from the community, as well as past Hasbro people were in said group, with a member count into the thousands. Feedback towards Aubrey’s work was often mixed, and any negative feedback resulted in Aubrey lashing out. This was our introduction to his personality, of Aubrey Sitterson the Wrestling fan, with a heel persona. We get it, he likes to be tongue in cheek. The G.I.Joe community has many member who are currently or have served in our nation’s – and other nation’s – Armed Forces. The tragedy of September 11th is still filled with passion and pain. Aubrey is fully entitled to his comments, but in this day of social media, that freedom of speech also has the responsibility of consequence. 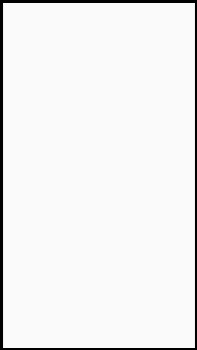 And alienating yourself from your core audience, along with actively antagonizing them, will bring out calls for a new author. I don’t think it can be stressed enough that Aubrey went out of his way to antagonize the community. This is an issue of people caring about the G.I. Joe brand, and they see Aubrey as harmful to the brand, and that he isn’t really concerned with helping or growing the G.I. Joe brand, as he is about growing his Twitter interactions. I have heard and read endless commentary from within the G.I.Joe community, and the vast majority do not feel that Aubrey is the right type of personality for the G.I. Joe brand, or any Hasbro brand, because at the end of the day, these are still children’s products. Let’s remember folk, that these are “children’s products” that fetishise the military. Just saying. Most people seemed to find that GI Joe cover rather fun. And the screencaps I have seen paint Aubrey in a different light. But it also suggests to me that YoJoe and others have basically been looking for an excuse to do Aubrey Sitterson in. Their objections are not to the tweets per se, but to Aubrey as a whole. For his changing ethnic and gender status of characters. For, I’m also told, to the move to GI Joe shooting lasers rather than bullets, against Quick Kick defeating Snake Eyes in battle and some have repeatedly spoken out against Aubrey Sitterson writing GI Joe while declaring himself to be a socialist. I have no screencaps of those examples (share any if you wish), but this from another GI Joe fansite HissTank isn’t far off common criticism as I understand it. Outrage videos were then made and posted on YouTube, as those who have repeatedly targeted minorities, women, LGBT folks and anyone with non-conservative politics, which massively increased the responses that IDW. Hasbro and Aubrey were getting, from thousands of people who never saw his original message or had previously engaged with Aubrey in any way, many even declaring that they didn’t read the GI Joe comic – but were now not going to start. Bleeding Cool covered the story once IDW started to respond by e-mails with a conciliatory tone. But then a committee sat, including IDW and Hasbro representatives and a much harsher official response was issued, with the suggestion of disciplinary matters. 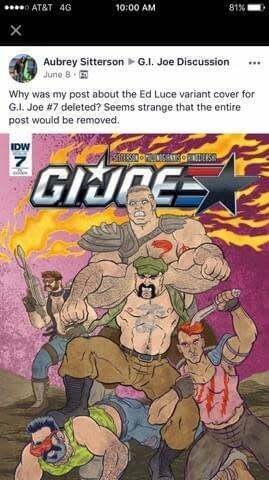 YoJoe was encouraged by IDW’s statement as were their members. 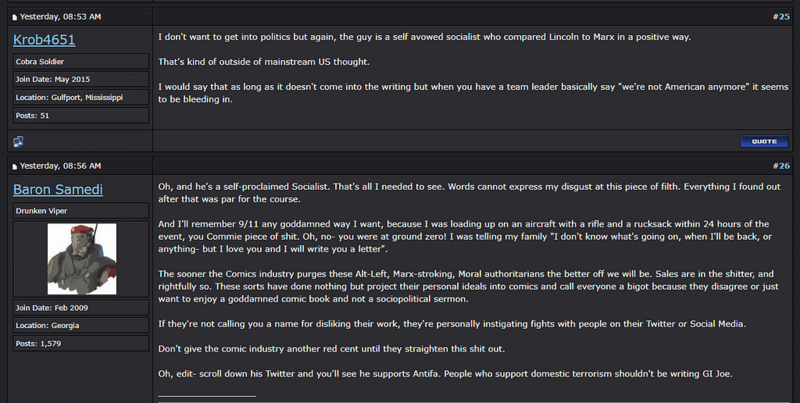 But fellow comic book creators of Aubrey are starting to rally around in response to IDW’s official statement. And they are not happy. Not a good look, guys. Won't be getting more of your books if you're giving @aubreysitterson the boot. Funny how this mobilised attempt to torch his career is coming from the "we shouldn't be driven out of comics for political opinions" crowd. 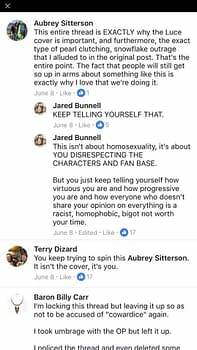 If @IDWPublishing capitulates to these targeted harassers & boots @aubreysitterson, it's going to massively embolden them to keep harassing. 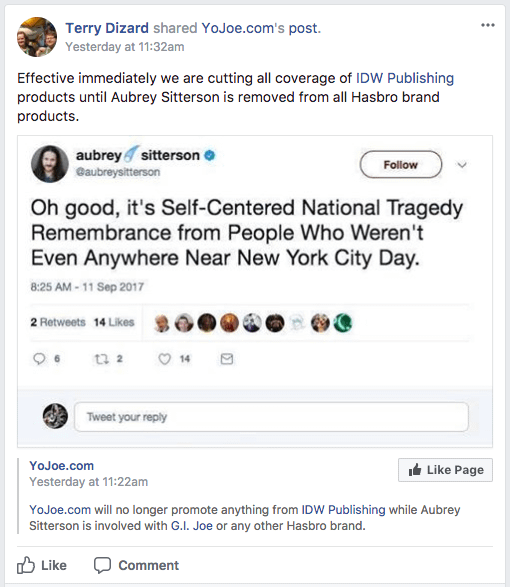 @IDWPublishing: I lost a friend in the WTC attacks and I'm not the least bit offended by anything @aubreysitterson said. I don't think anyone is going to hound that kid out of anywhere. He's got all-american staying power! I've made known my feelings about those who claim 9/11 yet despise NYC and New Yorkers. I'm with @aubreysitterson on this. It was Stan Lee who said that you should give the fans what they need, not what they want. I don’t think there’s ever been such a well-illustrated example of the gap between the two.